Local residents spread love and light with painted rocks. When Jes Stogdale picked up her first painted rock on a family vacation in Brevard County, Fla., last spring, she had no clue that she’d also picked up an idea that would resonate with hundreds of her fellow Gettysburg residents. Some of the rocks she found in Florida carried short messages of hope and love; some were beautifully painted; others featured simple, abstract designs. Stogdale soon discovered there was more to the process. As photos of the rocks appeared online, the likes and comments started coming in. Sometimes, the artists would introduce themselves. Other times, she’d see a found rock picked up and posted by someone else. With that winning combo, Stogdale was certain that rocks hidden in Gettysburg would have the potential to travel well beyond the borders of Adams County, spreading kindness both locally and all over the world. Stogdale’s excitement for the project spread to her mother, Karol Turner, and her aunt, Kerry Feaster. With several buckets of rocks, a box of acrylic paints, and some sealant, the three women sat down around a kitchen table to paint rocks. Stogdale’s children, Jeric, Brooke, and Brynn, and Feaster’s children, Ivan and Cheyenne Feaster and Dakota Spangler, soon joined them. Kerry set up a Facebook group called G-burg Rockz PA, and on June 7, 2017, they made their first “drop” of several hundred rocks. The next day, the painted rocks started popping up on the Facebook page. With some word of mouth and a few explanatory notes online, the number of followers skyrocketed. By the end of June, G-burg Rockz PA had more than 3,000 followers who were routinely finding, posting, and rehiding rocks. And to Jes’ delight, members of the Facebook group soon started to paint their own rocks. 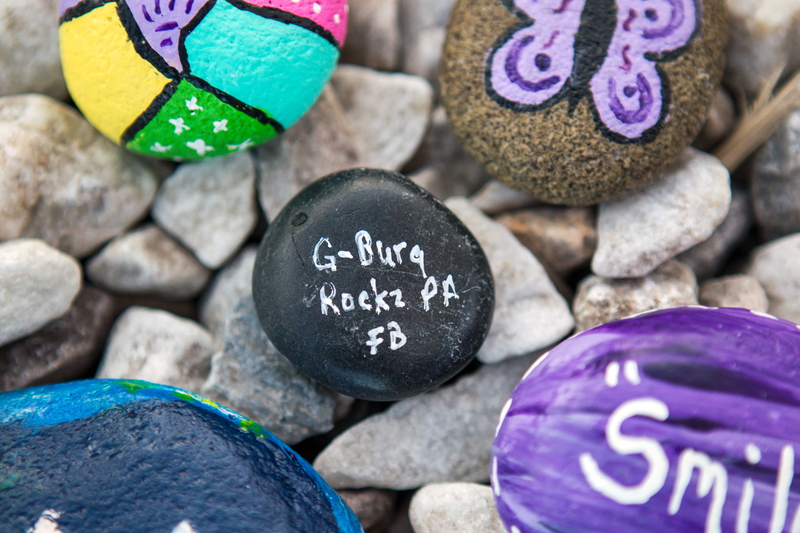 Today, with more than 12,600 members, the G-burg Rockz PA Facebook page is filled with story after story of painted rocks, both hidden and found. To some, the trend feels like the Pet Rock craze of the ’70s with a touch of Flat Stanley from the ’90s. But today’s painted rocks are more than just faces and fake hair, and with the help of the internet, the rocks travel much faster and farther than Flat Stanley ever could have managed via a postage stamp and a manila envelope. “Red-Haired Mama,” a rock portrait of Kerry painted by her 8-year-old son, Ivan, traveled from its original hiding place on South Washington Street in Gettysburg to Aberdeen, Scotland, with Kevin Heatly. Robbie Teal from East Berlin found one of Gettysburg resident Eva Luckenbaugh’s trademark paw print rocks and took it with her to the Cliffs of Moher, Ireland. Two more of Luckenbaugh’s rocks, “Wish” and “Hope,” made it to Toronto with her fellow Gettysburgian Kelly Eckard. The most well-traveled rock to date is a rainbow painted by 9-year-old Haylee Bolinger, a student at Lincoln Elementary School who took an interest in painting rocks with her grandmother, Lori Monn. Gettysburg resident Salena Green’s grandson, Michael Renoll, found Bolinger’s rock and Green rehid it on the grounds of Buckingham Palace, England, when she traveled there with her son, Miguel, and his soccer team, the Hanover U15 Red Hurricanes. It was still raining when Washington State resident Kate Andrews found Bolinger’s rock and brought it home with her to hide it in Selah, Wash.
As G-burg Rockz PA gained momentum, members began making even deeper, soulful connections through their artistic efforts. Bendersville resident Mikel Grimm recounts what started as an awkward moment as she and her daughter, Amaiah, were searching for rocks near Oakside Park in Biglerville. They had to explain to a homeowner why they were looking under the flowers at the edge of her yard. But the story soon turned heartwarming when Amaiah later found a bumblebee rock in the park and brought it back to the woman. Gettysburg resident Gwendolyn Williams Bigham posted to the Facebook page about a heart-warming and encouraging moment when she found a bright pink “Smile” rock with polka dots at the Gettysburg Cancer Center. “I sure needed this today,” she wrote. For Virginia resident Kristin March Brisson, the red rock with a gold heart that she picked up in the Outer Banks, N.C., brought a sense of peace and love after her grandfather, Linwood R. Drake, passed away in August. She placed the rock beside his grave and left a message for the unknown artist on the G-burg Rockz PA Facebook page. Jes and her family keep the rock trading going with comments and encouraging remarks on the group’s posts, but they also continue to paint and hide rocks around Gettysburg to keep everyone engaged. Jes estimates the number of rocks painted and hidden around Gettysburg tallies somewhere in the thousands. The number is hard to judge because not every rock finds its way to the Facebook page. Gettysburg and its residents are not unique to “being rocked.” In the six months since Jes started the G-burg Rockz PA Facebook page, Littlestown, New Oxford, Taneytown, and Hanover have also started similar community-building pages based on hiding and finding painted rocks. As Jes hoped, visitors to Gettysburg are also carrying the idea home with them. Michigan resident Brenda Giles visited Gettysburg in July, found her first rock here, and was inspired to start her own Facebook page in Gibralter, Mich. The good vibes continue even farther afield through The Kindness Rocks Project, a national grassroots rock-painting movement that Jes became aware of after she started G-burg Rockz PA.
Visit thekindnessrocksproject.com or follow G-burg Rockz PA on Facebook!